Apple's decision to launch the 128 GB iPad in February seems to make rumors of a new model in March or April appear unlikely, suggesting the fall as a more likely time for a refresh. 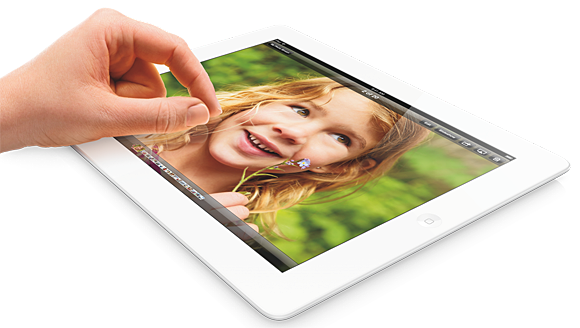 iLounge was among the sites to suggest a Spring 2013 date for the launch of the iPad 5, although the site has since backtracked from that claim to suggest that the device will be arriving in or around October. The generally reliable KGI Securities analyst Ming-Chi Kuo has also predicted a Q3 launch. World of Apple's Alex Brooks notes that Apple's release of the 128 GB iPad next week lends weight to the idea that Apple will henceforth be returning to an annual release cycle for new iPad models, keeping the tablet more closely in line with iPhone launches and major iOS updates. This is where the 128GB iPad comes in, the release sends a clear message that despite rumours to the contrary Apple will not release a new iPad in March or April and the next update to the iPad will come in October alongside the second iPad mini, iOS 7 and will ready Apple for another blockbuster year end. Brooks notes that it would be strange for Apple to return to releasing the iPad midway through the iPhone/iOS cycle, suggesting that the double update for the iPad in 2012 was an opportunity to both align the iPad with the launch schedule for the rest of Apple's device lineup and iOS and to make a wholesale shift to the new Lightning connector. Why they didn't just release the iPad 4 with the 128G in Febuary is beyond me. i'm pretty sure that is, in fact, exactly what they are doing. It made no sense whatsoever to release a new iPad in the spring. iPad 4 last October was both an opportunity to align the whole 2012 iOS ecosystem with lightning connector and also to upgrade the iPad 3 processor which was seriously slow for that screen. October seems like the obvious choice for updating the whole iPad segment (retina display on the mini and a new redesigned retina iPad) and also to release the 5S and iOS 7. I don't really think that iOS 6 will receive any further updates until then. They'll probably keep improving the maps service and concentrate on a new iOS which will surely have at least major app redesigns. We only this week saw leaks of the new casing. It will take months to ramp the new unit and we all know there will be a wide worldwide rollout of tens of millions of units. Logistically alone it would be surprising to see it released before September. Aren't they having enough issues meeting demand as it is without squeezing all their new product releases to within 2 months of each other and before the crucial last quarter? Surely this will be close to the iPhone release cycle unless they bring that forward to July/August. 1. They make no significant API changes for iOS7, and app developers don't need a beta period. The 7th iPhone and iOS 7 launch simultaneously. 2. They launch the 7th iPhone on iOS 6. iOS 7 doesn't launch until fall with iPads. 3. They launch the 7th iPhone with non-beta'd iOS 7, and all our apps blow up worse than ever before, with a LONG period to being fixed. Our they simply do as they've traditionally done before they moved to a September launch for the iPhone 4S/iOS 5 and hold a software event in the spring to introduce iOS 7 and release the final version alongside the iPhone 5S in June at WWDC. Since an AppleTV refresh is apparently coming they could launch that at the same event along with possible iTunes/iCloud improvements if they want additional content in the event. The fall iPad will then launch with iOS 7.1. The iPhone launching in June and the iPad following in September/October makes sense to properly align SoC development. The iPad uses an expanded GPU version of the iPhone SoC, so it's better that in each calendar year the iPhone introduces the A_ first and the iPad comes after with the A_X rather than being based on the previous year's SoC. Lot more to market leader than 'thinness'. I've gotten over that since iPhone 4/ iPad 2. Most everything is, thin enough. And if Amazon declares bankruptcy, their stock will double. To push the lightning standard through the Christmas season. Despite the other updates like processor and front camera, that little connector was the real reason the 4th gen iPad was launched so soon. With the price of flash memory cant we just get 64/128 and maybe 180. Are they really gonna stick with this 16GB? In this year of 2013 seems like we should be so much higher. I do get the cloud thing but you dont always have wifi or 3G/4G like if you are on a cruise or something.